Hairlessness is the ideal in Peterbald cats, but various unusual coat textures also exist in the breed. These include “brush”, “flocked,” and “velour.” The brush coat is essential is to the Peterbald breed for genetic reasons. The body is long and lean, and the head is shaped like an inverted triangle. Ears are extra large and pointed. All colors are seen in this breed. Peterbalds are bred to be intelligent, active cats. They also love attention and are known for being affectionate. They can be very playful and bold. Because they are hairless, Peterbalds need special care. They must be kept warm in cold weather, and shouldn’t be allowed outdoors. Peterbalds have a high metabolism and require more food that coated cats. Even though most Peterbalds do not have hair, they are not considered hypoallergenic. Wounds and scratches on this breed heal faster than on cats with slower metabolisms. 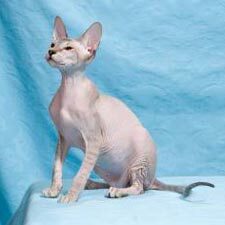 This breed was created in St. Petersburg, Russia, by crossing a male Don Hairless (or Donosky) with an Oriental Shorthair female. The result were oriental hairless cats—the first of which were born in 1994—that were given the name Peterbald. Siamese cats and Russian Blues were later added to the genetics as well. The International Cat Association (TICA) granted the breed Championship status in 2006.